In this post we’ll be seeing our review of the Citizen Eco-Drive Mens BM8475-26E Watch. Many who wear watches tend to worry about functional batteries especially when you have a battery-operated watch. The good news is that with Citizen Eco-Drive Men’s BM8475-26E Stainless Steel Watch, you no longer have to worry about the winding battery. Created by Citizen which is one of the oldest and most established watch brands in the world, if you are looking for an excellent timepiece that is anchored on the brand’s principles of quality and creativity, this watch might just be the one for you. It Gives You Reliability And Accuracy Since You No Longer Have To Constantly Adjust The Time And Date. The Watch’s Design Is Not Your Typical And Usual Design. It Looks Really Unique And Stylish. You Can Easily Change The Strap Depending On Your Preference. It Uses Japanese Quartz Movement Complemented With A Beautiful Analog Display. The Watch Is Water Resistant To 330 Ft Which Is Higher Compared To Other Watches. If You Are Looking For A Watch That You Can Always Wear For Formal Events And Functions, This May Not Be Your Choice.But Then Again, The Choice Of Style Is Subjective And Would Vary From One To Another. What makes the Citizen Eco Watch a highly-loved timepiece? Let’s go into its product features and specs. Citizen Eco-Watch sports a 42 mm stainless steel that comes with mineral dial window. It is a round watch that features luminous hands with beautiful Arabic indices and day window located at 3 o’clock. The watch has an analog display using Japanese quarts movement. It uses faux-leather brand with buckler closure. Citizen BM8475-26E is water resistant to 330 ft.
For many watch lovers, it is not just the functionality and specs alone. The design and over-all aesthetics of the watch is also considered. When you look at Citizen Eco-Watch is a very aesthetically pleasing timepiece. The hour markers colored orange is refreshing to the eyes because you do not see this kind of color scheme very often. It is stylish in a sense that it looks modern. But the nice thing about this watch is that you can wear it anytime and anywhere whether it is formal or informal. The unique color scheme is complemented with its tan leather strap. Depending on your preference, you can easily change the strap. One of the things that you will like about this watch is that it operates with a standard date/day complication. With its solar powered movement, it gives you reliable accuracy unlike no other which only means that you do not have to worry about getting the right time and date settings. When you wear and set the watch, it is accurate all throughout the day. You do not have to adjust the time. Citizen Eco-Watch is a well-built timepiece since it is made from stainless steel. It features mineral crystal which is a standard for most of the watches that you can find within the price range. The case is ion plated. In affordable watches you notice that the coatings of watches easily wear off. But the good thing is that it is not the case with Citizen Eco-watch. Citizen Eco-Watch BM845 comes with a tan leather strap and it is a very durable one. It does not wear out easily even if it gets stretched out. This can be attributed to the use of synthetic leather strap. This material is rubbery compared to using genuine leather. The clasp uses a black plated buckle. Another thing to love about the Citizen BM8475-26E is that it is water resistant to 100 m.
This is a pretty much good feature compared to other watches. Now, you can still wear your watch when you are snorkeling or swimming. But keep in mind that you cannot use it when you are scuba diving. For its price, Citizen Eco-Watch is truly a value for money watch. It gives you a very stylish design that comes with a reliable functionality that is lacking in some watches. Although it may not look like an expensive watch, it has the necessary features that you need a timepiece. You no longer have to think of winding battery with its solid battery life. In terms of accuracy, you can rely on it since you do not have to constantly adjust the time and date settings. The design of the watch is not your classical watch as it uses unique color scheme. The strap does not easily wear off and you can basically wear it in different settings whether it is formal or informal. Plus, it is water resistant to 100 m. So even when you are doing water activities, you never have to worry about your watch getting wet. 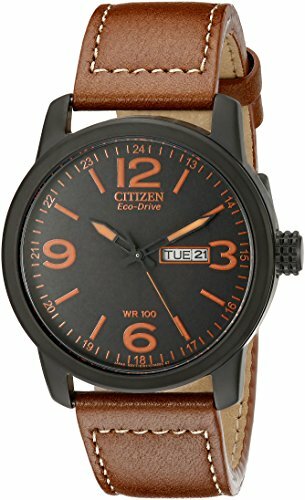 Over-all, Citizen Eco-watch is a good buy for entry level watches.